John Botero is the Program Manager of the Office of Court Professionals for the Judicial Council / Administrative Office of the Courts. As a Program Manager, John oversees the administrative process not only for the Commission on Interpreters, but also the Board of Court Reporters and the ad-hoc Committee on Process Servers. 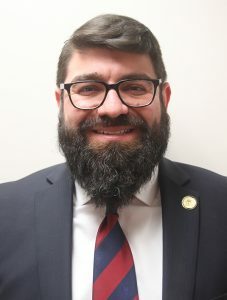 Before working with the Judicial Council / Administrative Office of the Courts, John worked with the Judicial Branch of the State of Connecticut in the Stamford-Norwalk Judicial District, first as an Interpreter and then as a Court Clerk. John graduated from Pace University’s Dyson College of Arts and Science with a Master of Public Administration. John obtained his Bachelor of Arts from the City University of New York’s John Jay College of Criminal Justice in 2006. As an interpreter, John gained the experience of understanding the important role of interpreters and how they operate on a day-to-day basis. He brought the knowledge of this profession to his current role, where he seeks to improve the role of the interpreters in Georgia’s courts and the Commission’s role and level of assistance to all parties and improving equal access to justice. John speaks Spanish, French and Portuguese.